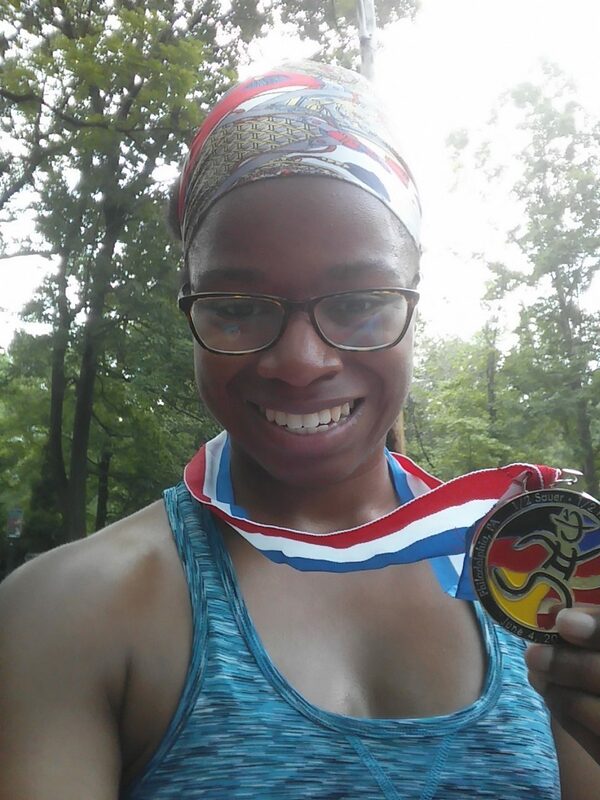 This past Sunday, I ran my 9th half marathon – the Rock ‘n Roll Philly Half Marathon. It was a doozy. If you follow me on Instagram, you know it didn’t go as well as I hoped, but since a few days have passed, I think I have a much better perspective than I did before. So I’m going to tell you all about how this race went! Once again, I must disclose that I am Rock ‘N Blogger this year and had free admission to the half marathon and VIP area. All of my opinions are completely honest! I’m linking up with Erika, Patty, and Marcia for Tuesdays on the Run! I’m also joining Annmarie, Nicole, Jen, and Michelle for Wild Workout Wednesday! 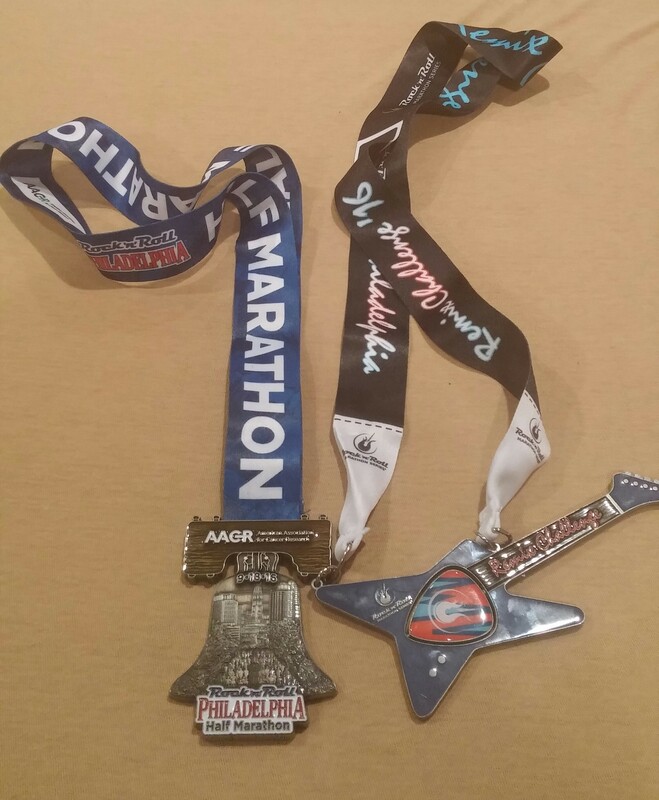 This was my third time running the RNR Half Marathon in Philly – I previously ran the race in 2011 and 2014. Originally, I wasn’t going to do the half marathon this year because I planned to run the ZOOMA Cape Cod Half Marathon the following weekend. In a twist of fate(? ), that half marathon was converted to a fun run 10K (which I’ll be participating in next weekend), so I was able to sign up for RNR after all! I’ve shared my goals for this half marathon. Since my half marathon races over the past year have been between 2:15 and 2:19, I had a conservative goal of 2:15 and some wishful thinking that if the stars would align, I could approach my PR of 2:10:53 that was set at RNR Philly in 2011. I’ve been marathon training since August (and pre-training since July), so I knew I’d have the fitness to perform well in this race. Of course, in addition to that I was nervous as hell! The Expo for Rock ‘n Roll Philly took place on Friday and Saturday. Since I was running the 5K and half, I had to pick up my things on Friday, so I went to the Expo at the Pennsylvania Convention Center after work around 4:00 pm. After parking and making my way to the entrance, I saw MaryBeth, a fellow City Fit Girl that I don’t get to see very often. She was heading to the Reading Terminal Market so we didn’t get to talk long, but she was running both races too! Rock ‘N Roll races are great in that they are so consistent – you always know what to expect. Picking up my bibs, race T-shirts, wristbands for the Remix medal and VIP were ridiculously easy. Because it was Friday evening and I didn’t want to deal with traffic, I didn’t stay long at the Expo. There looked to be plenty of giveaways and lots of things to buy. A few vendors suckered me into talking to them, but I got out relatively unscathed. I will say that the Expo seemed smaller than in years past, but maybe it was my imagination. Obviously, Saturday was pretty busy. If you didn’t catch my recap of the Rock ‘n Roll Philly 5K, you definitely should! I had a really fun time. When I got home from the 5K, I made sure to thoroughly foam roll and stretch my muscles. I wanted to make sure I’d be loose on Sunday! I relaxed and hydrated as much as I could until it was time for bed, sometime around 10 pm. I had all of my clothing laid out so I’d be ready for the morning. Unfortunately, I slept terribly the night before the race. I had an awful dream that I overslept but was still trying to make it to the half marathon. Ugh. I woke up at 5:00 am to prepare myself for the big day. I had a simple breakfast of toast and strawberry preserves. Lately on my long runs, I have been using UCAN Snack bars as pre-run fuel, but out of the 2 bars that remain, I couldn’t trust either flavor…so I didn’t want to take the risk. Bret, his mom, and I left the house just a little bit after 6:00 am. I thought it would best to park in West Philly and then walk over the Spring Garden Bridge to get to all the action. Unfortunately, this took a little bit longer than I realized, as we had to search for a spot. We eventually found one and then the walk over the bridge seemed to take forever! Maybe I was just being anxious again…but it was already approaching 6:40 and unfortunately, I wasn’t going to be able to make the 6:50 group photo with City Fit Girls. I headed to the VIP area and I was so excited to see Michelle from Running With Attitude. It was our first time meeting! She is so sweet and it was great to talk all things running with her! It was like catching up with an old friend! We got a photo together and then we soon saw Kathryn from Dancing to Running, who I previously met at RNR DC. She’s another one of my faves. We were all in pretty good spirits, even though the weather was extremely humid out, though at least it wasn’t too hot. Coffee, if you’re into that sort of thing! 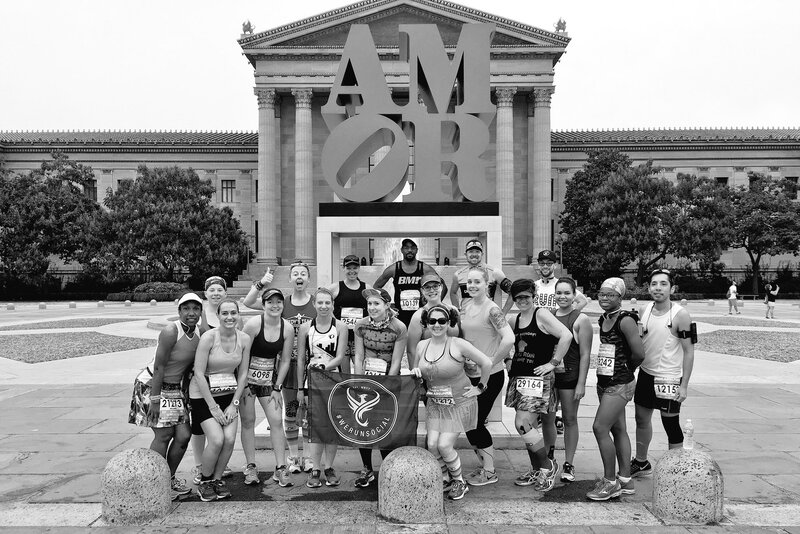 We headed to the top of the famed Art Museum Steps for a photo with We Run Social and several other Rock ‘n Bloggers. The view was gorgeous! Before I knew it, it was time to hit the VIP potty (no lines! ), stretch, and head to my corral. I was placed in Corral 18 so I knew that it would be at least a half hour until I’d be able to cross the starting line. I didn’t see anyone I knew, so I was a lone wolf. Apparently, there were 40,000 participants in the race, and it definitely felt like it! It was very crowded, but people were in good spirits and I was hopeful to have a strong race. The race heads down the Ben Franklin Parkway and towards Center City. I was able to see Bret and his mom as I headed off. We were extremely tight in the first mile due to construction on the Vine Street Expressway and the Parkway, so it took a while for things to open up. We ran down Arch Street, turned on 21st Street to Market and made our away around City Hall. I was feeling pretty good, but apparently, I was going much faster than I realized. I regularly looked at my Nike+ watch, but it’s always inaccurate. And while I was determined to hit the tangents, somehow I ended up running way more mileage than I wanted and ended up being over 0.1 mile off. The middle of the race was absolutely the worst part for me. Fairmount Avenue was a challenge, but at least it was interesting. Kelly Drive, on the other hand, is boring and endless. I have run down Kelly Drive probably 100 times at this point, and while I have raced down this path many times, it is still very mentally challenging! I don’t think it helped that my music playlist was not giving me life! I should have used my Girl Power playlist during this race…I needed all the motivation I could get! So I struggled, and I felt myself getting slower and slower. Ugh. The humidity really started to take its toll. I tried to talk to myself (internally) and keep my spirits up, but I was already soaked at this point and I knew I had a very long way to go. My energy wasn’t as sharp either and I was worried about becoming dehydrated, though I took regular sips from my water bottle. Suddenly around mile 7-8 I heard a large crowd behind me, and much to my dismay, I realized it was the 2:15 pacers. I was comfortably ahead of them on Fairmount Ave, but now, they were passing me…and I’d never catch up. Heading towards the East Falls Bridge was a hill that I know all too well and it felt longer than usual. Around mile 9 I also started to feel pain on the bottom of my right foot and between my toes. While I love racing in my Mizuno Wave Rider 19’s, it seems that every race, I always seem to have discomfort in my right foot around mile 9! Weird… Crossing the bridge was torture and I was moving so slowly that I almost wanted to start walking…but I didn’t. I kept trying to say “one more mile”. I was surrounded by so many miserable people, so I knew I wasn’t alone, but it’s tough. At this point, I knew that I was so close to being finished…but I was still so far away! I did the best that I could to keep pushing. Fortunately, I like running down MLK Drive, so it wasn’t as torturous as the previous miles on Kelly Drive. After mile 10 I decided I would fill up my water bottle at a station and take the opportunity to have a brief walk. Of course, the next station was over a mile away! I really hoped that my math was wrong and somehow I was closer to 2:15 than 2:20…but I may have just been delirious, lol. I was able to see Bret and his mom one more time, I think I had maybe 1/4 mile left to go. I powered up the hill leading to the Art Museum one last time and made it across the line. Thank God it was over! While my Nike+ watch gave me a time of exactly 2:19:00, my official race time was 2:18:55. My total distance was 13.38 miles. When I saw my results, I was very, very disappointed. How could I have done so poorly on this race? How could I have felt so miserable when I have been training in the heat and humidity since July? I felt extremely defeated. I’ve had to do a lot of reflecting. I’m even thinking about writing a dedicated blog post about this. But I think that having even the tiniest thought of a PR during this race was my downfall. I know good and well that humidity is my Kryptonite. I never run well in that kind of weather. When I think about the RNR DC half last spring, that was a race that I used purely as a training run and I enjoyed everything around me. I was smiling during that race, not grimacing. I’ve thought of every scenario; the fact that this is my first long race of the season (vs. my last half marathon which was at the end of a busy racing season), the fact that my training runs have averaged in the 12-minute pace zone, the fact that this wasn’t a goal race! I’m feeling better about things now, but I still wish things didn’t crash the way they did. I’m still angry with my Nike+ watch that continues to fool me on my paces. My biggest wish was that I could have enjoyed this race more. I wanted to have fun, and a majority of the race was NOT fun. I was miserable. I will have to face racing on Kelly Drive again for the full marathon, so at least I can say I got some practice. I went back to VIP and found Kathryn and hung out with her for a bit – she got her PR (yay!). I changed out of my shoes as my right foot was really tender on the bottom (though I’m sure my weak flip-flops didn’t help matters), wiped down with a towel I brought, then cleaned up for some grub. The catered food was wonderful – if only I had more of an appetite! I did make sure I had two mimosas! I didn’t get a massage because there was a waiting list and I didn’t want Bret and his mom to hang around for too long, though I probably needed it! Then I went and wandered around to find where to get my Remix medal for completing the 5K and half marathon until finally we headed back home. The Rock ‘N Roll Half Marathon truly is a great race in the city of Philadelphia, but I’ll be taking a break from it for a few years. As I’ve mentioned a few times, I don’t like running the same races too often since there are so many out there to enjoy. If you’re looking for a Philly race, this is a great one to add to your list…when the weather’s just right, lol! Once again, great swag. The finisher’s medal is absolutely beautiful. The Liberty Bell is gorgeous and the Remix medal is really creative and cool! Rock ‘N Roll definitely has the most stylish swag that I’ve seen! Great crowd support. While I didn’t see too many funny signs this year, there were tons of spectators out which is always a help during a tough race. I also loved that you could see the same spectators multiple times…the support is appreciated! Plenty of fueling stations. I only used one during the course, but despite that last stop taking an eternity to get to, they were plentiful. Amazing VIP experience. I loved the VIP! I didn’t get to take advantage of all the perks but you really got your money’s worth. But is there a way we can get a reduced-priced VIP ticket for spectators so that they can at least be in the same area too? Fairmount Avenue was great. The addition of Fairmount Avenue to the course was a great idea. Even though the hills were tough, I loved running through my old ‘hood. If you’re a Philly local, running The Loop is a drag. Despite the few detours on the race, you’re spending a majority of the race on The Loop. I thought that moving away would make Kelly Drive a breath of fresh air, but nope! The Finisher’s Village is like a huge maze. I got lost so many times. The signage, especially for VIP, was difficult to find, and I had to make a long walk to pick up my extra medal. I guess it just wasn’t intuitive enough for me. Race photos are expensive. You can get a ton of great pictures (I already have at least 25 from both races), but they are expensive. There are still some great ones from RNR DC that I haven’t purchased yet because they’re so pricey. Now that my racing weekend is over, it’s time to get back to focusing on the true goal…completing my very first marathon! I learned a lot about myself during this half, so I will have to channel that energy into making the most of my remaining weeks of training. Did you have a race this past weekend? If so, how did it go? Do you struggle with races with high humidity? I’m also sharing this post with Julie’s Best of the Blogs monthly linkup!